Congratulations! You just found out you’re getting a tax refund this year. If you have bad credit, however, the best use of that money is not buying something expensive or lavish. We know – bummer. Instead of spending your refund, use it to help rebuild credit. It doesn’t matter how much you’re getting back, even the smallest amount can be put to good use and can help strengthen your credit score. Here are some ways you can make your 2017 tax refund work for you by using it to rebuild credit. If you have any accounts in collections, we always suggest you start there. According to Credit Sesame, “In the newest versions of the FICO and VantageScore credit scores…paying or settling your delinquent debts, specifically those that have been sent to collections, can result in a higher credit score. Both FICO 9 and VantageScore 3.0 exclude collection accounts from score calculations once they’ve been paid off.” So use your tax refund to chip away – or completely pay off – any accounts in collections. Doing so can immediately raise your credit score for an instant win. By bringing down the balances on your credit cards, you can start bringing up your credit score. There are multiple strategies you can use to pay off your balances, including starting with the smallest balance or the card with the highest interest rate. Each strategy has its advantages, and it’s really up to you to decide which card should be paid down first. If you’re wondering how much it’s going to take to completely pay off your credit cards, use this calculator to find out. 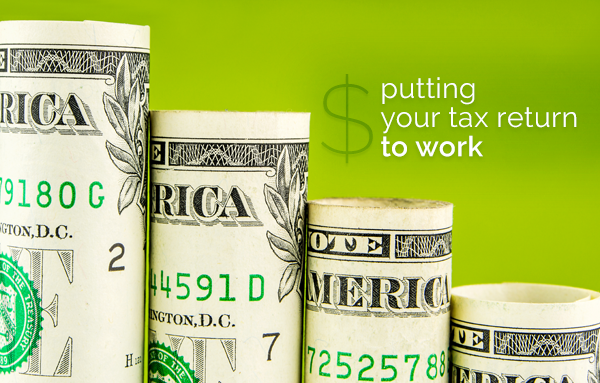 Investing the money is another great way to use your refund to help you build your credit. Place it in a high-interest savings account or high-interest checking account to start building an emergency fund. While building up a savings account won’t immediately affect your credit score, it can help you rely less on credit cards for future purchases. Apply for a secured credit card such as the UNITY Visa Secured Card. A secured card, or second chance credit card, is a card that works like any other credit card but is funded by your own money. It is treated like other credit cards in the eyes of the three credit bureaus, so using it wisely can help you rebuild your credit score. By using your tax refund to fund your new UNITY Visa Secured Card, you can also take advantage of our How to Rebuild Credit Program. Through working one-on-one with us, you can use your secured Visa card prudently and strategically to raise your credit score. Don’t worry about not getting approved due to your bad credit. Cards like the UNITY Visa are made to help people with bad credit get out of their current situation and into a better financial position. The minimum deposit we accept is $250, which will equal your credit line. Getting money back during tax time can mean finally buying that pricey item you’ve been eyeing. But if you have bad credit, using that money to rebuild your credit would be a much better option. Take your tax refund and open your new UNITY Visa Secured Card today. This is precisely what my husband and I were planning to do! Good to see it's the right move financially. I enjoyed reading about your products you have to offer and look forward to doing business in the near future. How do i invest in some shares with one united? Thank you for reaching out to us here at OneUnited Bank and we appreciate your interest in investing in us. OneUnited Bank is a privately held institution. We are not a publicly traded company. At this time we are not available on the stock exchange. For example, if you receive 4K back in the form of a refund, place that amount in a secured account through a money market, cd or another financial vehicle.of your banking institution. You then have this amount to utilize as you borrow against your "own" money that is in the bank. If payments are at a very moderate rate lets say $200.00 a month. You in turn payback your money less than 2 years. In that time period you would have increased your credit score immediately with the bank loan and have your 4k in the bank as you utilize the 4k you borrowed against. A no brainer win! win! If for some reason you have a hardship repaying the money, your financial institution can rework your note to accomodate..
Low hanging fruit! Great information needs to be shared! We see such a connection with college planning, so we just had to post this on our Facebook page: https://www.facebook.com/thePREPFactory/ We invite you to check out our post.